Check out an adorable snap taken and tweeted by Cheryl of her with Kimberley at her opening night of Shrek where she plays Princess Fiona, also there to support Kimberley is Nicola and GA manager Hillary Shaw. Click above to view full image in the gallery. 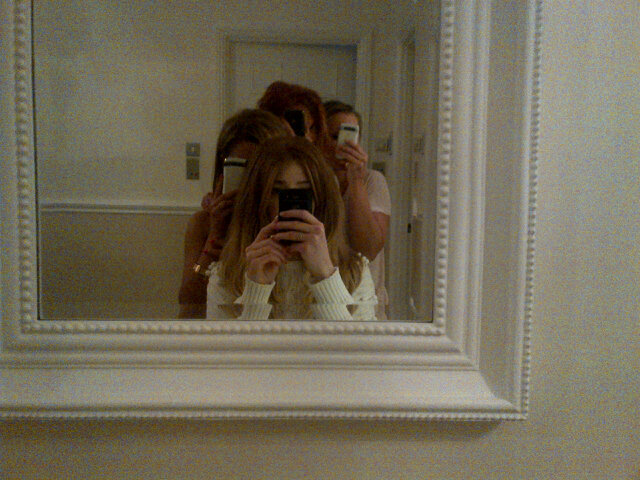 Check out an adorable picture Nicola Roberts tweeted of her girls night in with Cheryl, Kimberley and Sarah! Cheryl finally gave up her Twitter mention virginity…to bandmate and bestfriend Nicola Roberts! Cheryl first tweeted and mentioned Nicola, Nicola then shortly tweeted back returning the love. How adorable! Now we just need Nadine and Cheryl to tweet eachother, and perhaps get Kimberley and Sarah on Twitter then we’re all set. We’re suffering a little bit of a decent news drought, but hang in there, I’m sure there will be some news soon! The world is safe! Nadine tweeted Cheryl during the late hours of last night welcoming Cheryl to Twitter! This is so adorable, feud what now? I hope Chez replies.